Ah, it’s delicious to dream up a story, invent characters, fall in love with a whole new world you’ve spent ages creating. It’s even more delicious when a publisher reads your beloved book idea and says, “Ooh, yes, please!”. There’s a flip-side, of course. It’s when your delicious dream of a story goes out into the world, and publishers don’t want it, usually because they’re publishing something that’s a bit too similar. That’s when you want to run away and drown yourself in a vat of chocolate. I mean, how could you know another author had gone and come up with an idea/character that’s hugely, coincidentally like yours? Being pointed towards a THIS can make lots of authors come out in a nervous rash, I know. But I’ve come to realise that I actually like the challenge of taking an editor’s suggestion and decorating it with a whole lot of me-isms. 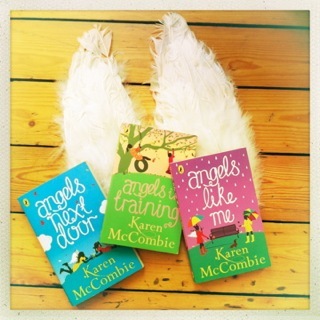 In fact, in the last two years, I’ve written about very ordinary angels (in my ANGELS NEXT DOOR trilogy) because editor Amanda Punter at Puffin wondered what I’d do, mixing up normal girls with magic. 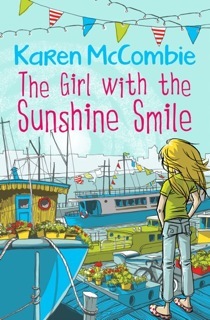 For indie publishers Barrington Stoke, I set THE GIRL WITH THE SUNSHINE SMILE on a barge, because their MD Mairi Kidd lives on one, and she came up with the idea while we had tea and biscuits on deck. She didn’t need to finish the sentence. “Me? Evacuees?” I mumbled, and the cogs in my brain began clunking and whirling. Previous post ← be aMAZEd! The Joy Of What If…? Sounds like a book title, doesn’t it? Ha! 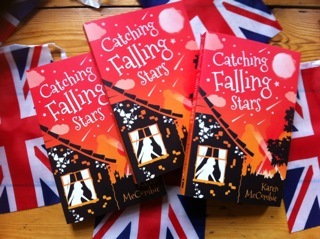 Reminds me of that song ” swinging on a star” …I work better when I’ve got something to launch from ..that’s why I get so much out of writing workshops….shame there aren’t any near me! I think it reminds me of English lessons in school… I used to love being presented with a topic and finding myself set free to write what I wanted from that nugget. It’s fun too to think what different directions you could go in, just starting from the same topic. It could depend on what mood you were in on the day you started writing too! Long time now chat , can’t wait to your new book, hope it is good. p.s I changed my blog name last year from booklol16.